Blu-ray may be majestic, but it also has risks of disc damage from playback. And fetching the exact disc you really want from tons of discs is pretty nerve-racking. That’s why more and more people try to seek a solution, aiming to protect their expensive Blu-ray discs and enjoy HD videos at the same time. Transforming Blu-ray to other formats supported by multimedia players is no doubt a good idea. Considering video effect, H.265 is an excellent choice,which is said to double the data compression ratio compared to H.264/MPEG-4 AVC at the same level of video quality. It can alternatively be used to provide substantially improved video quality at the same bit rate. Therefore,more and more multimedia players can support H.265 format. For satisfying this desire, various kinds of H.265 converters are created.Here, Pavtube BDMagic is an excellent 2D/3D Blu-ray to H.265 MP4 ripper with original video/audio quality. The converted H.265 MP4 video can be played on VLC Player, DivX Player and Pot Player,etc. Here is the review. It can even export any format, of course depending on how close to the original source you want them to be ,for accommodating to various format supported specification of multiple multimedia players. How to transform Blu-ray to H.265.MP4 for watching? Insert your Blu-ray disc into your BD drive , lauch your H.265 MP4 converter and click “file” icon to choose “load from disc” to load the video that you want to rip from disc source. 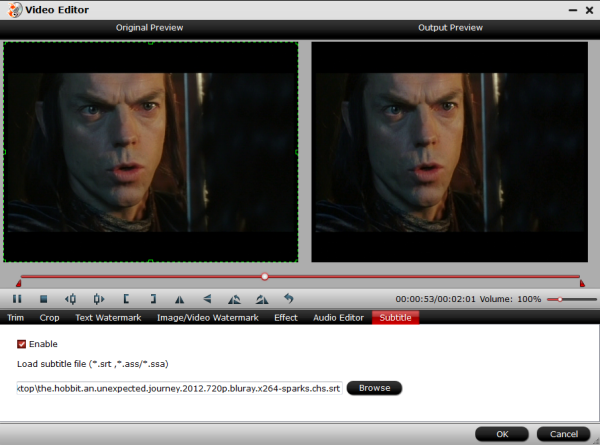 For Mac users, you can turn to Pavtube BDMagic for Mac. 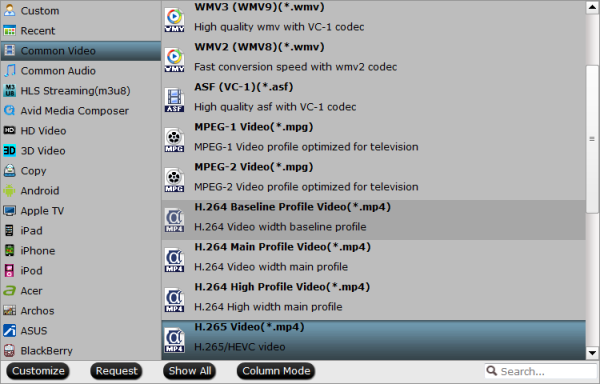 From the “format “ drop-down list, you can find “Common Video” option, click “H.265 Video (*. MP4)” in the option bar. If you have some special requirements of video and audio, you should click the settings to change the format parameters of codec and size.etc. 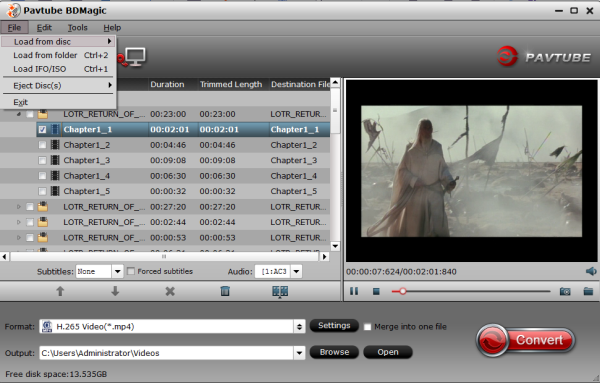 Click “Edit” in menu bar, you can customize your own video. If you want to cut off black areas of source video which can have an influence on visual effect, the “crop” will not fail you. If the movie is a foreign one whose language is difficult for to understand, you can add your mother tongue subtitle downloaded from opensubtitles.org by clicking “subtitle”.Just hit other function icons, they will surprise you. Tap “Browse” to choose output storage space. When all settings are done, hit the red “Convert” button to start transformation. After conversion, click “Open” icon to unfold output file destination,locate the created H.265 MP4 video and you can watch it on you player. How to Play Blu-ray on Wii-U and Wii?